Please note the album art support has been added to the jBlackGlass ipodphoto too. I fixed the OnScreen keyboard bug too, so now that should be displayed in the right place, and you can download a prebuild binary with the 64MB cache support for the iPod5g 60gb too. 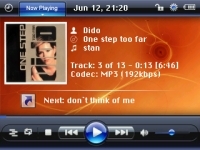 Note for Prebuild binaries: IMPORTANT: you will need the latest rockbox daily build and after installing that on you iPod overwrite the files with the ones from my build. If you wish to make your own build, you can find all the patches here. ok, when i use the themes, the text up at the top of the screen it aligned correctly, it's scooted too far up. and, whenever i am listening to the song at the WPS, the text is on the wrong side of the screen! Pretty cool! Love everything about it dude. The only minor thing is that artwork is not working with me... I got all your build, still no arts. I think the problem is that you don't have a cover.bmp in your music directory. See here for more info regarding covers. Yous should make your covers 100x100 with 24-bit. Hope this helps, write me if there are still problems. right on! thanks for helping out. 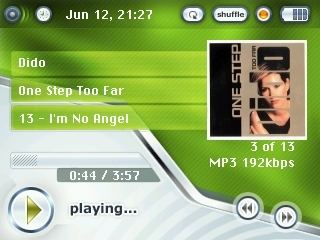 Btw, do you know of any software that can extract album art from MP3 and save it as cover.bmp? which was released a few days ago and seems to be a better implementation? and I already added the new patch to my binary, just there are some problems because the patches conflict with eachother, so I have to work that out, but you should have the new binaries by this weekend. Wow, great stuff. I look forward to it, keep up the great work! I'm having a problem whilst scrolling through my file tree directory. I DID find the scrolling acceleration settings, and set them all to very (10s) low places. However, when I scroll up or down, it goes right through the list without letting me stop anywhere in the middle. It goes waaaaaaaaaaaaaaaaaay too fast. Is the link on the first page the most recent version of this patched build ? If so, what could it be that is wrong ? I'd really like to fix this asap, as I'd like to show this off to my friend who works for Apple (and got me the iPod w/his discount etc). I think he'd be very impressed with it in good working order. You can change the scrollwheel acceleration value yourself using the "Menu -> General Settings -> System -> Ipod Scroll Whell acceleration" menu on your ipod. First off, thanks for the AWESOME THEMES. 2ndly, Thanks for adding the albumart patch! now I don't have to fool around with cygwin, etc. I'm loving these themes too. Also having the same album art issues as Cezar - any way of displaying album art from ID3? I'm a mediamonkey user and the auto-tag from amazon feature is my prefered method for filling in the blanks. One more question: how does the scrobbler function work? Thank you again for your hard work and great design! and ask the author the same questions, maybe he can help you out, and if he implements this to his patch I will include it in my next build, that's for sure. Still haven't gotten the album art situation figured out but I'll keep trying. I tried the "Rockscrob" site and it worked like a charm. Can't wait to see what you do next! The jBlackGlass-5 wps for iPod Photo/Color is a bit messed up, tho I haven't bothered to take a look at it. BTW, love your work! Thanks. 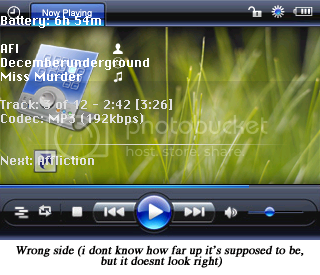 Ah, okay...looks like you've got the iPod video version of the bg.bmp in the wps dir where the color version should be. HATS OFF TO U MAN ROCKIN THEMES !! :) ..well the problem im facing is abt album-art .i did everything as said in ur previous posts .but still i dun find em on my pod. plz help me on this !! Good job on your themes and supporting-of-newbies. I've got it all working like a charm and damn but does it look good - I tend to run jBlackglass-11. I've just not been able, so far, to figure out what that little white square to the right of the shuffle and repeat indicators indicates. Does it just fill up space nicely? Or is there some esoteric setting that I haven't thought to fiddle with to experiment? 2 issues: Firstly, the wps/jBlackGlass-5/bg.bmp in the iPod Photo theme pack is the wrong size; it's 320x240 (the iPod Video size), not 220x176. I've tried to generate a correct image from the .psd file; you can grab it from my wiki. Could you make one for the iPod Nano? A good wps with cover art (or adapt one of these)? Or do you know of any good ones for Nano with Cover Art? Xerocool: the album art won't work with my builds, at least not for now, Senab was the one who did builds with the album art patch for my themes too, but now he has gone to college, so I will start building my builds again, and I will add album art patch to it soon, but I won't have time to make new builds every week, I will do them once a month or so. OO and note too, I will only add patches wich are relevant to my themes and which are pretty useful like pauseonunplug and so on. Kai: Thanks, I'm happy you like them, regarding the white square, isn't that the repeat indicator? but please note I updated the themes and fixed the bugs in the photo ver, so maybe it's worth a try to redownload and check it out. Ed Catmur: I'm very happy that you joind the rockbox club :) regarding your foundings, I fixed the photo ver with the wrong background image, and regarding the album art size, I left it on 50x50 cos that's a standard size, but now we have the new album art patch which can resize the images, so you may play around :) but I prefer to stay with the 50x50 because as I noticed most of the people prefer this size, but correct me if I'm wrong guys! Juan Pablo: The only thing keeping me from porting this themes all over all platforms is the time, as you know most of us have an official job and they do these things in their free time, and that's exactly with me too, so I would better spend my time on fixing issues like scrolling text in the customline.patch as porting themes over because porting them over is not so hard, just download my psd and make a smaller version of it and there you go. You'll have to cut out the pictures and put them together in wps, but after you did your first one you will notice it's easier as you thought. Hello, i'm creating a H10 black glass fo H10, and i'm looking for Artist, CD and title PNG like your icons. Where wan i find that?? Thanks, and great themes and patches! to mention only a few of them. Thanks, i know deviantart and some others, but didn't found! Dude your work is AWESOME! U should see me show off with my ipod now! When I add cover.bmp to album folders and try running any songs from the album, it plays, but when I then try to go to a menu or anything, it crashes. Any ideas? Additionally: the album art doesn't show up. I love your build, but when ever I initialize the ID3 tag database, the hard drive just "works" for 10+ minutes and I only have 1450 songs... I am using "rockbox-jbuild-5g-20070120-cop.zip"
I love your themes, specially Green 5g. When do you plan to incorporate the LCD Brightness Patch to your binaries ? This is the only setting I am missing for my iPod 5G Rockbox. Hope that this patch can be applied easy and soon. Best regards and keep on your good work. hey julius, great work my only prob on the 5.5 gen is that the text starts to high and the music progress bar is hidden by the picture. any help would be awesome. having the same prob with the 5g 60g. The progress bar is lower than it's supposed to overlapping the text mentionning the song title. Still is some very nice work you did. Amazingly improves the ipod experience!! hey sorry but im having a problem. I download this and it looks great on my ipod. but when i choose a song the song title/artist or anything about it shows up when im listening to it. it jsut shows like a laptop looking thing and next to it theres three litle icon things. i think thats where the info goes. also it dosent show the next. what i did was downloaded the zip which came with four folders. 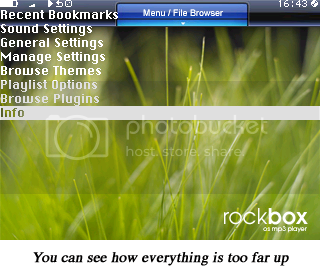 And i put the four folders inside the .rockbox folder. When i click on the ipod drive thing on my computer it shows up .rockbox,calender, notes,contacts, all that . And i clicked on the .rockbox folder and put the folders in there. I did it right...right? the current time in song and total track time lines dont work for me. its just completely blank, leaving nothing showing but the gray background. anyone else have this issue or know how to fix it? I know i'll sound like a retard for asling this but i'm new to all this i was wondering how i could get the theme with the blue background and put it on my ipod. p.s. plese give a fully detailed list of instructions such as what i need to download and what i need to put on my computer because there seems like alot of files. Any time I try to install your jbuild, it says no partition found. connect usb cable and fix it. I've tried installing it a few times and still same results. Its the 5g 80gb so i'm using the 64mb release. I extracted it to the root and overwrote files just like you said.